Our ‘Adopt a Cow’ option is for those who would like to contribute to the ongoing maintenance and health of an individual cow. 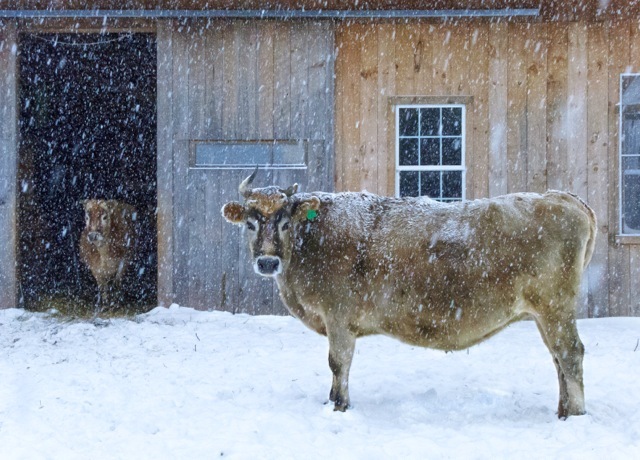 The cost for this will vary from farm to farm or sanctuary depending on factors such as the number of winter months the cows need to eat hay, and whether caretakers are volunteers or paid workers. The average cost for maintaining one cow is calculated to be $ 200 per month. 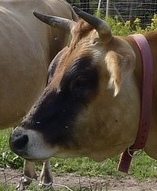 If you select this option you will receive photos and updates about the cow(s) being cared for in your name. If you are interested in sponsoring one or more cows in this way, please select the name of the cow and you can set up an automatic monthly donation for the cow(s) you would like to adopt. As The Cows Foundation expands we will have an expanding family of cows from many different farms and sanctuaries to adopt. Here are a few cows who would like to meet you. I’m Gopi, as you can see I’m an all weather girl. I love being outside, no matter what. I feel very claustrophobic if I’m closed in, so I am happy to be part of this herd where we can be outside 365 days a year if we like. I was born a ‘freemartin’, because I had a twin brother. Freemartins usually don’t get to live because we are unable to reproduce and give milk, but I was allowed to stay with my mother and am now eleven years old. My special quality is my singing voice—yes I really do sing—you have to hear it to believe it. I can also belt out a big “MOOO” if I want to, but usually I just sing softly to myself. Our land has a beautiful lake on it and pastures with the best tasting grass, but in the winter and spring and some of autumn we need hay to supplement our diet, which is quite costly when there is a big family to feed. If you would like to help feed me, we would be so grateful. 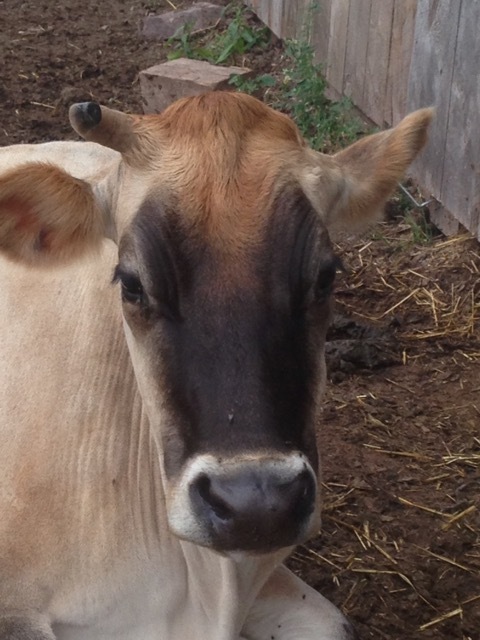 Donate to the Soma Gosala herd of cows in Shandelee, NY. 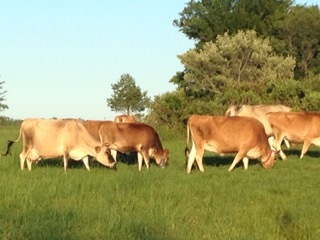 For over five generations this herd has been cared for following the four principals of The Cows Foundation. There are ten cows in this herd and they have good grazing in summer but need hay in winter. They live out their lives with generations of a family staying together. $36,000 a year is needed to support this herd. Kavita is a beautiful mother, very protective. She spend the first year of her life only with her mother, with no human interacton, so she appreciates being given her space. But when she knows her calf needs help finding a teat when it is first born, she will ask you to come and help. Choti is a breakout artist. There is no fencing that will keep her in when something better is on the other side. She grew up in an environment with people around who loved to feed her apples and treats, so if they don’t come to her, she will go looking for them! She has a dear and thoughtful heart. Priya is the star of a delightful book titled “Through the Eyes of Priya”. Priya is very dear, which is the meaning of her name. 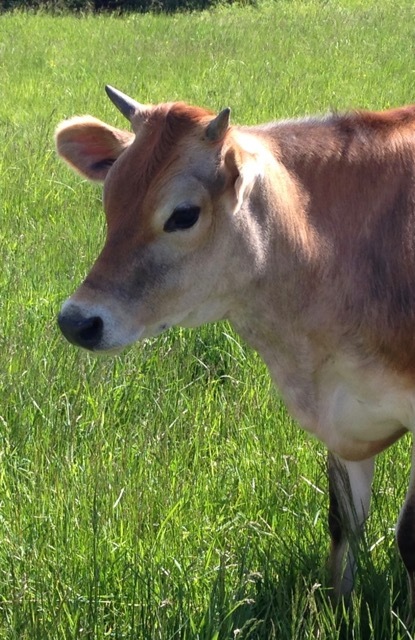 Priya was rescued before she was “shipped off” because one of her teats is damaged. She entered her new herd as the smallest and without the horns everyone else had, but soon became their leader. She knows what she wants and is also kind. Keshavi is a real sweetheart. Tender, soft, loving. Very thoughtful to those tending to the cows. 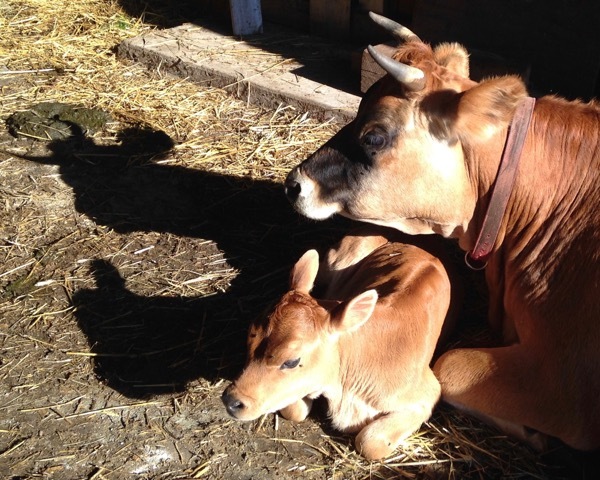 She did not wish to become a good milking cow, so she will live out her life with her daughter Jubilee and nourish from her heart. There was a beautiful Rainbow at the time Rainbow was born. 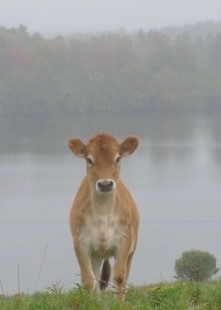 She is a sweet cow, the daughter of a great mother Davey. She has always been very nourishing to all the younger calves. Rainbow had her first calf, Dhanya, in the spring of 2018. 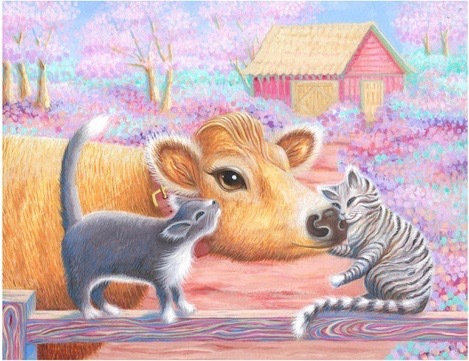 Rainbow was happy to offer milk to both Dhanya and Dhanya’s best friend, Dakshina, who was born in the same week. It is so natural for cows to be mothers. Hasita is Priyas daughter and also stars in the book “Through the Eyes of Priya”. Hasita is very determined like her mother, but adorable too. She is independent and loves to be loved (likes all the attention). Neelesh is Chotis son and a very royal, kind, and peaceful boy who loves his mother and three half sisters and is gentle to those who care for him. 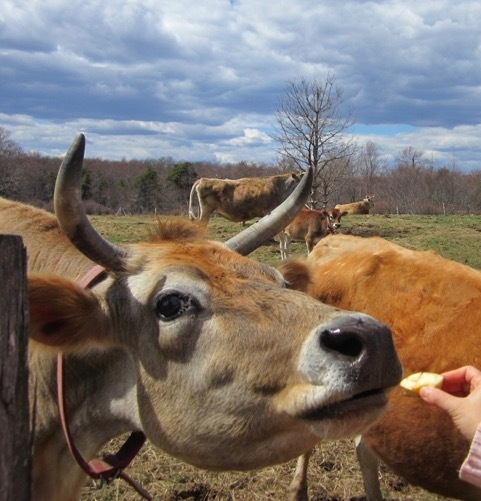 Tala Ram is living out his life at the Laxmi Sanctuary for cows in PA. When he arrived at the sanctuary they changed his name to Bala Ram, meaning strength …he is both tender and strong! You have chosen to donate $200 monthly. 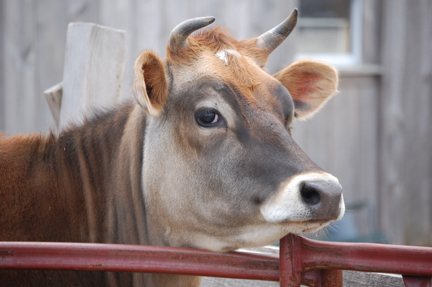 Your Donation to The Cows Foundation will allow more and more cows to live out their lives in natural, supportive, humane environments. note: Donations to The Cows Foundation, a 501 (c) (3) organization, are tax-deductible for US taxpayers.